A black and white negative of the 401 looking east from the Brock Street bridge. In this view the on an off ramps can be seen on either side of the photograph. There is a sign in the centre of the highway. The 401 stretched as far east as Oshawa starting in 1947. 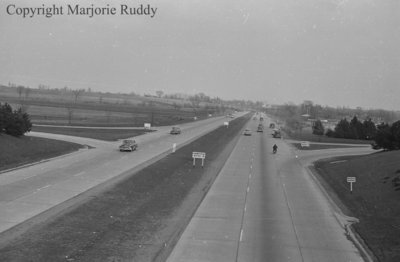 Highway 401 at Brock Street, c.1947, Marjorie Ruddy. Whitby Archives A2013_040_837J.